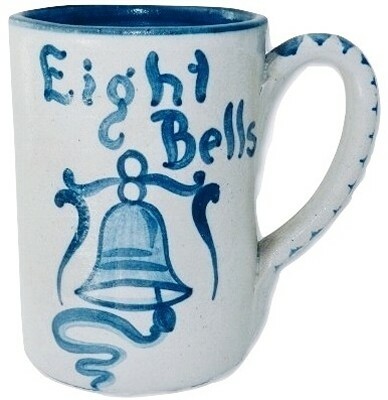 DORCHESTER POTTERY "EIGHT BELLS" tall coffee mug by "KNESSETH DENISONS". Measures 4 5/8" X 5" X 3 1/2". One tiny burst bubble flea bite on the blue band near the top rim. No chips, cracks or repairs. DORCHESTER POTTERY STONEWARE 12" Platter by N. Ricci fecit & C.A.H. for Charles Allen Hill. 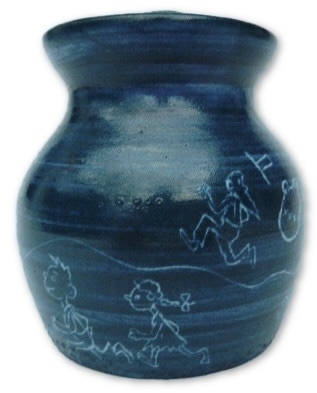 This patriotic item is decorated in the Sgraffito technique. 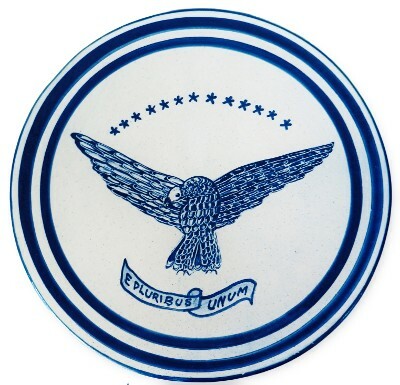 Dresden Blue decoration of an outstretched American Bald Eagle along with 13 stars representing the original 13 United States and the logo "E PLURIBUS UNUM" within a banner. 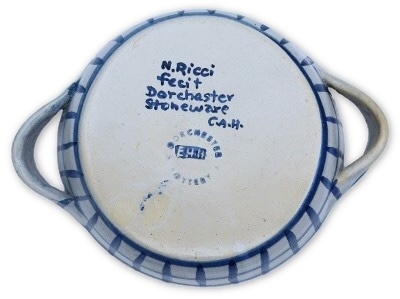 The reverse side is marked "N. Ricci fecit Dorchester Stoneware C.A.H." 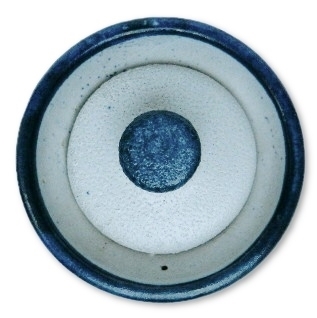 There is one extremely tiny flea bite glaze flake in one of the blue bands, it is very possible that this occurred in the manufacturing process. Other than the noted flea bite, No chips, cracks or repairs. DORCHESTER POTTERY "FANTASY" Pattern 3 foot bowl artist signed N. Ricci fecit and C.A.H. for Charles Allen Hill. 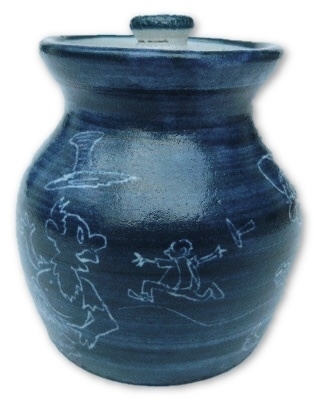 This is one of the most magical Dorchester Pottery patterns you could wish for. 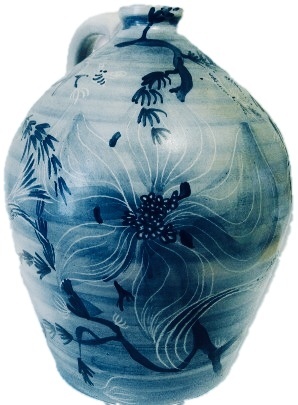 The hand incised and painted Dragonflies, Bees and Flowers cover the interior and exterior of this magnificent item. Measures 8" across and sits 2 3/4" high. There is also the original stock label intact on the underside. No chips, cracks or repairs. 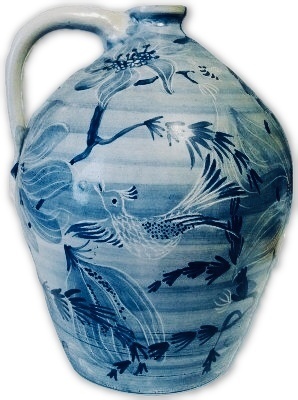 MAGNIFICENT DORCHESTER POTTERY FANTASY pattern handled jug artist signed JBC (Jackie B. Callder). 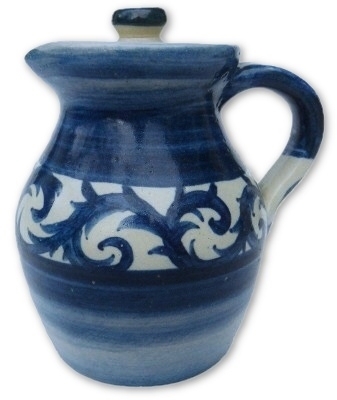 This one of a kind and very important American art pottery jug measures 11 7/8" tall and 8" across at the widest point. 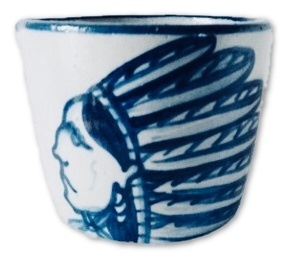 Marked on the base "Dorchester Pottery 1867 J.B.C." The broadly painted magnolia flowers, blossoms, branches are adorned with exotic birds, bees, flies and other sorts of whimsical insects. 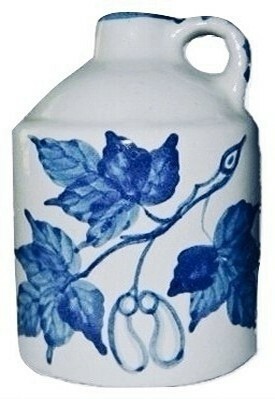 The jug is also marked JBC at the base of the applied handle. No chips, cracks or repairs. 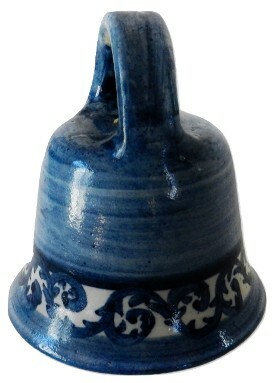 DORCHESTER POTTERY (STONEWARE) "FIDDLEHEAD FERN" pattern cow style handled dinner bell. This item is unsigned though we absolutely guarantee this item to be correct and original. The original unglazed stoneware clapper hangs from what also appear to be its original string. Measures 4 1/2" X 3 3/4". We are calling this item as unsigned but there possibly appears to be the initials C.A.H. where the handle attaches to the body of the bell. 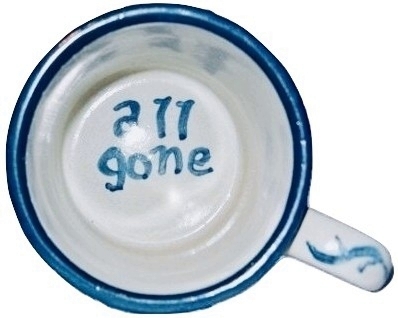 The dark blue color seems to flow over the area causing a definitive ID as to the artist marks impossible though the item is unquestionably by Dorchester Pottery. No chips, cracks or repairs. 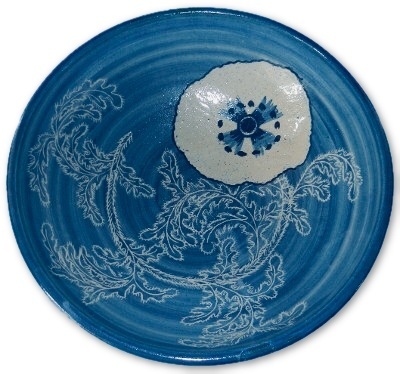 DORCHESTER POTTERY "FIDDLEHEAD FERN" pattern bowl. Artist signed C.A.H. for Charles Allen Hill. Measures 6" across and sits 2 1/2" high. There are small in the making glaze pops and small firing separations of the glaze which show the color of the ceramic below the surface. No chips, cracks or repairs. 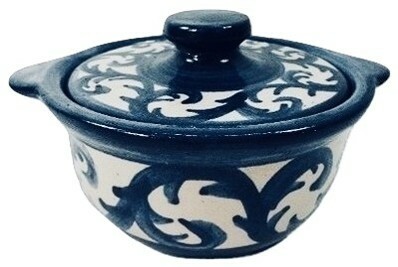 DORCHESTER STONEWARE POTTERY "FIDDLEHEAD FERN" pattern covered large casserole. Potter and artist signed N. RICCI fecit & C.A.H. (Charles Allen Hill). Measures 9" X 6" and the main body has two large lug handles. No chips, cracks or repairs. DORCHESTER POTTERY "FIDDLEHEAD FERN" creamer and sugar set. Artist signed C.A.H. for Charles Allen Hill and E.H.H. in a flag for Ethel Hill Henderson. The creamer measures 4 1/4" from spout to handle and sits 3" high. The covered sugar measures 3 1/4" X 3 1/4". No chips, cracks or repairs. DORCHESTER POTTERY "FIDDLEHEAD FERN" creamer and sugar set. Artist signed C.A.H. for Charles Allen Hill. 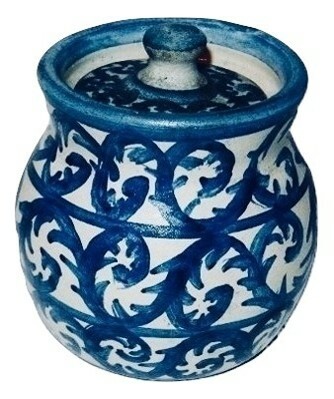 The lid on the sugar pot is also decorated in the Fiddlehead Fern pattern. 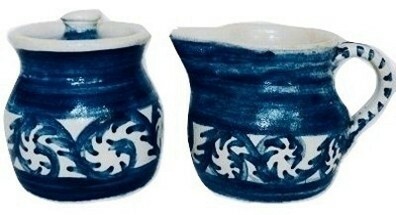 Creamer measures 4 1/2" from spout to handle and sits 3" high. The covered sugar measures 4" X 3 1/4". No chips, cracks or repairs. DORCHESTER POTTERY "FIDDLEHEAD FERN" creamer and sugar set. Artist signed C.A.H. for Charles Allen Hill and E.H.H. in a flag for Ethel Hill Henderson and dated 1776-1976. 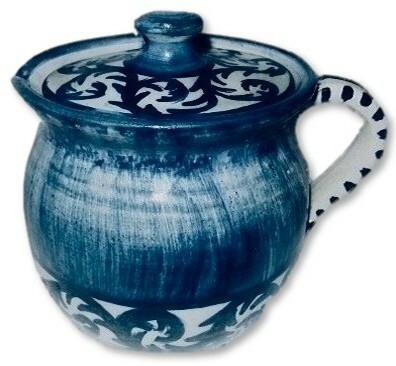 The creamer measures 4 1/4" from spout to handle and sits 3" high. The covered sugar measures 3 1/2" X 3". No chips, cracks or repairs. 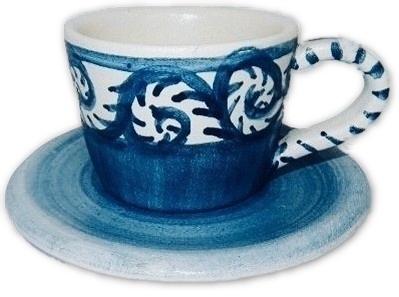 DORCHESTER POTTERY 1775-1975 demitasse cup & saucer signed C.A.H for Charles Allen Hill along with E.H.H. for Ethel Hill Henderson "FIDDLEHEAD FERN" pattern set. The saucer measures 4 1/2" the cup measures 3 3/4" X 2 1/2" X 2". No chips, cracks or repairs. 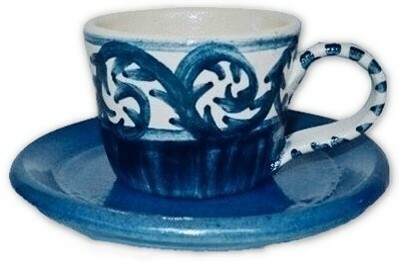 DORCHESTER POTTERY demitasse cup & saucer signed C.A.H for Charles Allen Hill along with E.H.H. for Ethel Hill Henderson "FIDDLEHEAD FERN" pattern set. The saucer is not marked and measures 4 3/4" the cup measures 3 3/4" X 2 1/2" X 2". No chips, cracks or repairs. 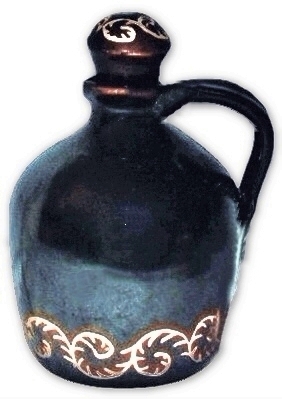 DORCHESTER STONEWARE "FIDDLEHEAD FERN" pattern brown glazed stoppered jug. Signed N. RICCI fecit & C.A.H. (Charles Allen Hill). Measures 5 1/4" X 4" X 3". 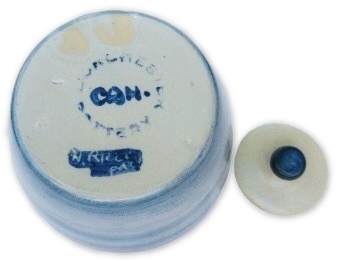 As is common for this form, the stopper fits loosely. No chips, cracks or repairs. 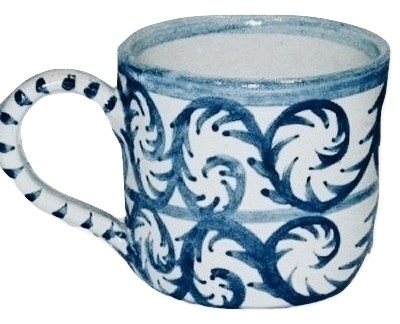 DORCHESTER POTTERY FIDDLEHEAD FERN pattern mug. Artist signed C.A.H. (Charles Allen Hill) and E.H.H. (Edith Hill Henderson. Measures 4 1/2" X 3 3/4". No chips, cracks or repairs. 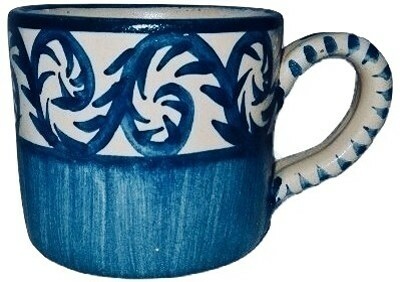 DORCHESTER POTTERY "DOUBLE FIDDLEHEAD FERN" pattern can style mug, artist signed E.H.H. for Ethel Hill Henderson and C.A.H. for Charles Allen Hill. Measures 4 3/4" X 3 1/4" X 2 3/4". No chips, cracks or repairs. 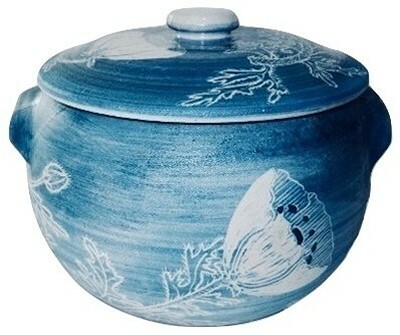 DORCHESTER POTTERY 2 handled covered onion soup crock in the "FIDDLEHEAD FERN" pattern. Artist signed C.A.H. for Charles Allen Hill. Measures 5 1/2" X 3". No chips, cracks or repairs. 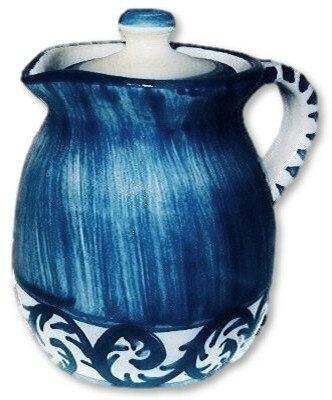 DORCHESTER STONEWARE POTTERY "FIDDLEHEAD FERN" pattern covered pitcher. Signed by both N. Ricci fecit and C.A.H. for Charles Allen Hill. Measures 5 1/4" across from spout to handle, 4 1/2" tall and 3 1/2" wide. No chips, cracks or repairs. 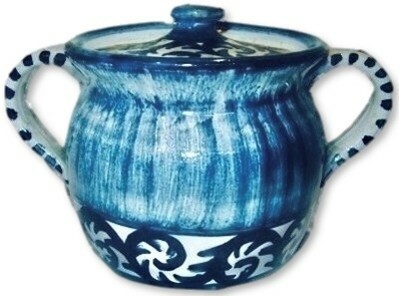 DORCHESTER STONEWARE POTTERY "FIDDLEHEAD FERN" pattern covered pitcher. Signed by both N. Ricci fecit and C.A.H. for Charles Allen Hill. Measures 5 7/8" across from spout to handle, 4 3/4" tall and 4 1/4" wide. No chips, cracks or repairs. 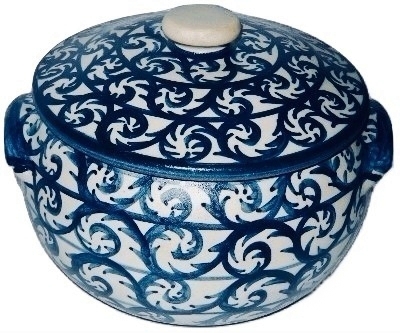 DORCHESTER STONEWARE (Pottery) 2 handled covered pot in the "FIDDLEHEAD FERN" pattern. Artist signed by both N. Ricci fecit and C.A.H. for Charles Allen Hill. Measures 6 1/2" X 4 1/4" X 4 1/4". 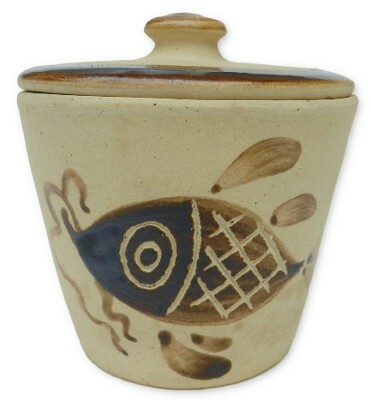 The lid sits a little loosely yet this is the correct and original lid for this item. No chips, cracks or repairs. 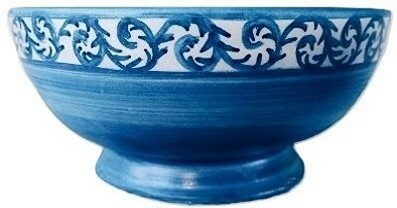 DORCHESTER STONEWARE (Pottery) "FIDDLEHEAD FERN" pattern massive PUNCH BOWL. Artist signed by both N. Ricci fecit and C.A.H. for Charles Allen Hill. Measures 12 1/2" X 5 1/2". No chips, cracks or repairs, normal firing separations on the underside base for an item of this size. 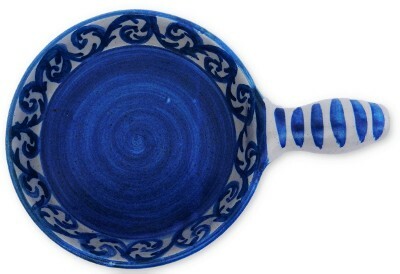 Dorchester Stoneware Pottery "Fiddlehead Fern" skillet by N. Ricci fecit and painted by Charles Allen Hill. Measures 9 1/2" long overall including the handle, the skillet part is 6 1/2" across and 1 3/8" deep. No chips, cracks or repairs. DORCHESTER POTTERY "FIDDLEHEAD FERN" covered pot artist signed C.A.H. for Charles Allen Hill. Measures 3 3/4" X 3 1/4". No chips, cracks or repairs. 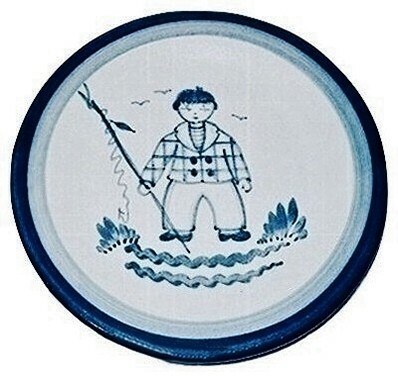 DORCHESTER POTTERY portrait plate of a fishing boy artist decorated by Knesseth Denisons. Measures 7 1/2" across. No chips, cracks or repairs. DORCHESTER POTTERY Artist Signed C.A.H. initials for Charles Allen Hill hand incised FLEUR DE LIS brown on tan bowl. 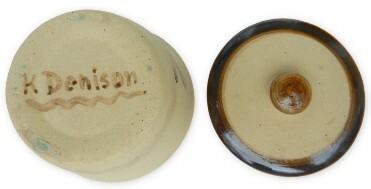 The underside is inscribed DORCHESTER POTTERY C.A.H. Measures 5 1/8" X 2 1/8". 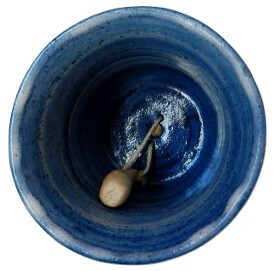 There are a few very small glaze skips on the which appear to be glazed over and from the manufacturing process. No chips, cracks or repairs. 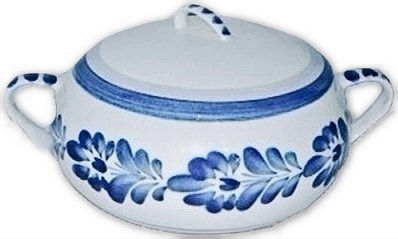 DORCHESTER POTTERY artist signed KNESSETH DENISONS large, blue, and white "Flower Frieze" decorated covered handled casserole. Measures 9 3/4" across X 7 3/4" X 5 1/2". Signed with the artists full name; Knesseth Denisons. No chips, cracks or repairs. 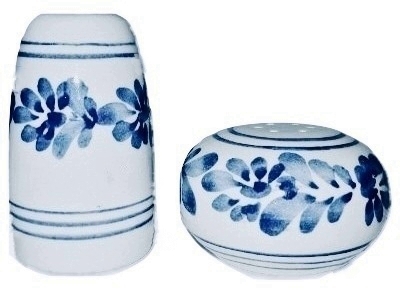 DORCHESTER POTTERY artist signed KNESSETH DENISONS Blue and White Flower Frieze salt and pepper shaker set. The shakers measure 2 3/4" X 1 1/4" and the other 2" X 3 1/4". There are no corks with this set though they are readily available at most stores. No chips, cracks or repairs. DORCHESTER POTTERY portrait plate of a girl holding a flower, artist decorated by Knesseth Denisons. Measures 7 1/2" across. No chips, cracks or repairs. 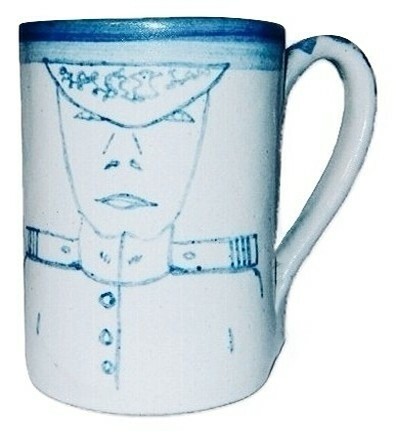 DORCHESTER POTTERY "GENERAL PORTRAIT" tall coffee mug. 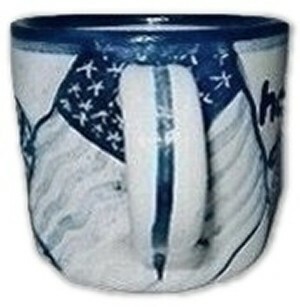 This is a very unusual decoration on this "unsigned" guaranteed original Dorchester Pottery mug. Measures 4 1/2" x 4 1/2" x 3 1/4". No chips, cracks or repairs. 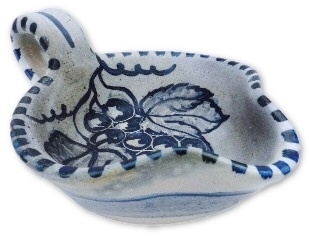 Dorchester Pottery "Grape" handled cobbler. Signed N. Ricci and C.A.H for Charles Allen Hill. Measures 9" X 7" X 1 3/4". No chips, cracks or repairs. 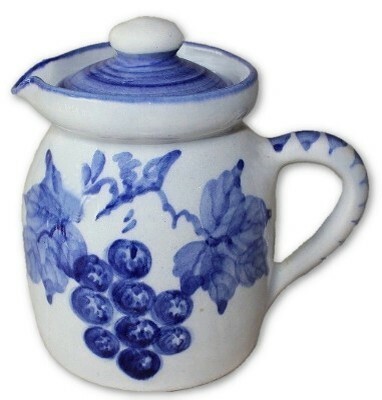 DORCHESTER POTTERY "GRAPE" covered creamer by "KNESSETH DENISONS". This item is covered in a very unusual glossy glaze. Measures 3 1/2" X 4". There is one tiny flea bite size pin prick on the lip, no other chips, cracks or repairs. 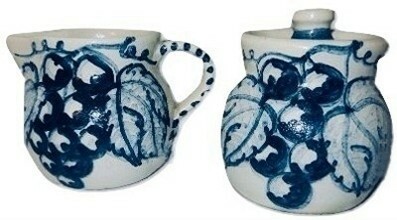 DORCHESTER POTTERY "GRAPE AND LATTICE" pattern creamer and sugar set decorated by C.A.H. for Charles Allen Hill and designed by E.H.H. Ethel Hill Henderson. 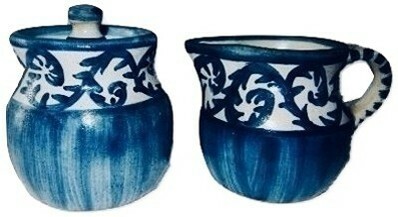 The creamer measures 4 1/2" from spout to handle and sits 3" high while the covered sugar pot measures 3 1/2" X 3 1/4". No chips, cracks or repairs. 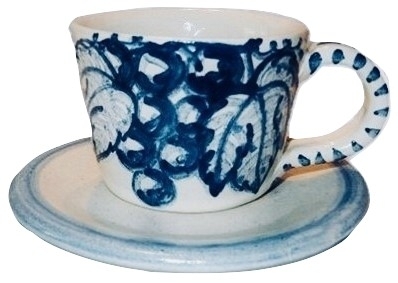 DORCHESTER POTTERY 1776-1976 demitasse cup & saucer signed C.A.H for Charles Allen Hill along with E.H.H. 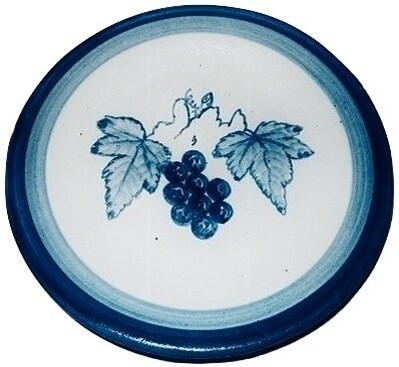 for Ethel Hill Henderson "GRAPE" pattern set. The saucer measures 4 1/2" the cup measures 3 3/4" X 2 1/2" X 2". No chips, cracks or repairs. 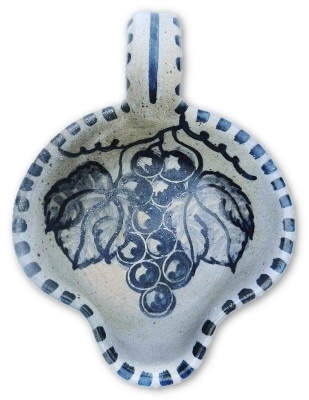 Dorchester Pottery "Grape" handled nappy. Signed N. Ricci and C.A.H for Charles Allen Hill. Measures 5 1/2" X 4 1/2" X 2". No chips, cracks or repairs. 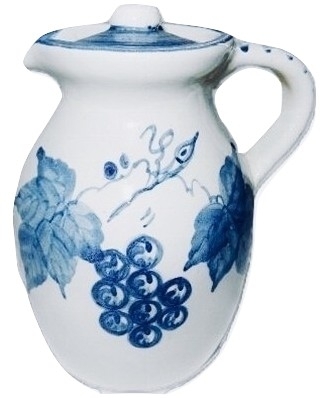 DORCHESTER POTTERY "GRAPE" covered pitcher by "KNESSETH DENISONS". This item is covered in a very unusual glossy glaze. Measures 5 1/4" X 4" X 3 1/4". No chips, cracks or repairs. 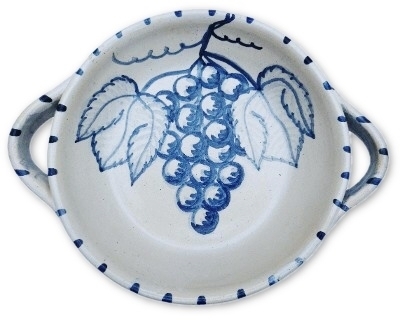 DORCHESTER POTTERY (STONEWARE) low edge dish in the "GRAPE" pattern. 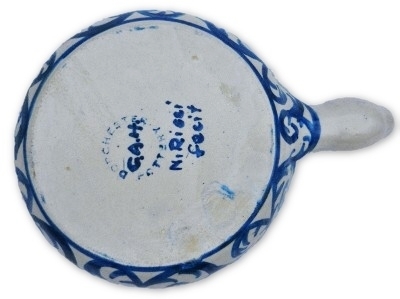 This item was signed and thrown by N. Ricci fecit and decorated and signed C.A.H. for Charles Allen Hill. Measures 6 1/4" across and the lip stands at 1 1/4" high. No chips, cracks or repairs. 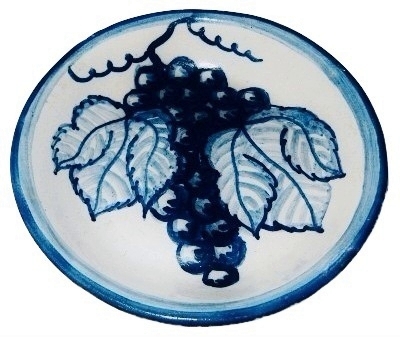 DORCHESTER POTTERY artist signed KNESSETH DENISONS hand decorated GRAPE & LEAVES plate. This item measures 7 1/2" across. No chips, cracks or repairs. 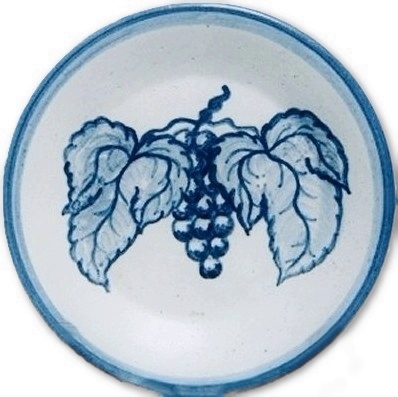 DORCHESTER POTTERY artist signed C.A.HILL (Charles Allen Hill) hand decorated GRAPE & LEAVES plate. Measures 7 1/2" across and sits 7/8" high. No chips, cracks or repairs. 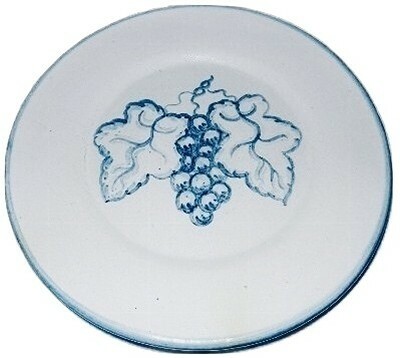 DORCHESTER STONEWARE POTTERY Grape pattern 9 3/4" large plate. This item is unsigned. 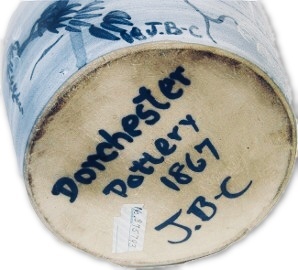 At one point, Dorchester Pottery did use a paper label and this item is most likely one made during this period. No chips, cracks or repairs. 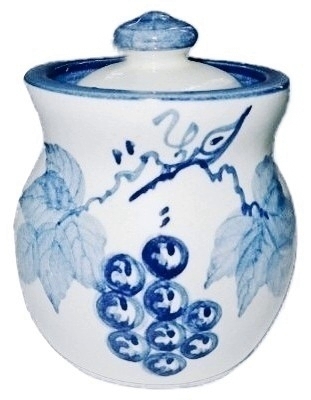 DORCHESTER POTTERY "GRAPE" covered pot by "KNESSETH DENISONS". This item is covered in a very unusual glossy glaze. Measures 3 1/2" X 3 1/4". No chips, cracks or repairs. 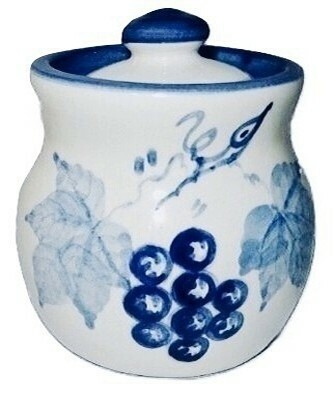 DORCHESTER POTTERY "GRAPE" glossy glazed covered pot by Knesseth Denisons. Stands 3 1/2" X 3". No chips, crack or repairs. 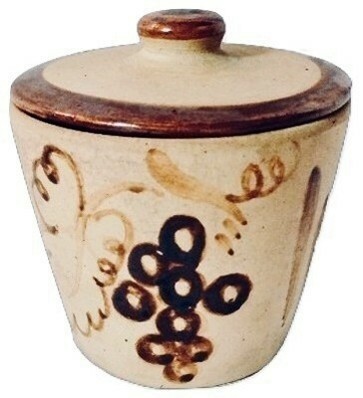 DORCHESTER POTTERY "GRAPE" unusual brown on tan covered pot by K. Denisons. Stands 3 1/2" X 3 1/4". There is one tiny pin prick pit flake mid body which appears to have occurred during the firing removal process. No other chips, crack or repairs. 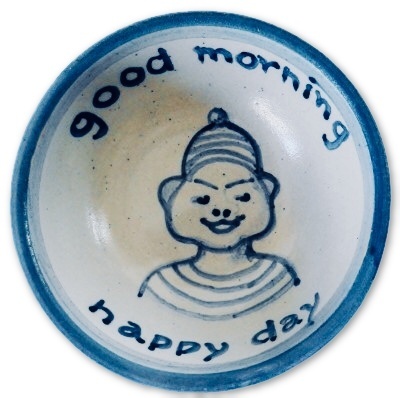 DORCHESTER POTTERY "PORTRAIT" cereal bowl with the phrases; "HAPPY DAY" & "GOOD MORNING" decorated and artist signed C.A.H. for Charles Allen Hill. The devilish boy with stripes across his knit cap and shirt surely made more than its share of people laugh. Measures 5 3/4" X 2". No chips, cracks or repairs. DORCHESTER POTTERY double artist signed C.A.H Charles Allen Hill and E.H.H. 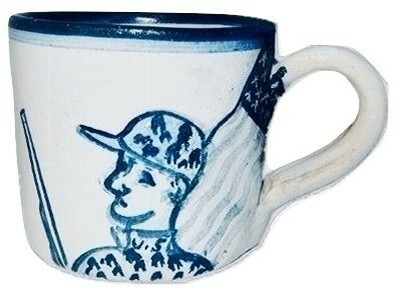 Ethel Hill Henderson Portrait Mug. 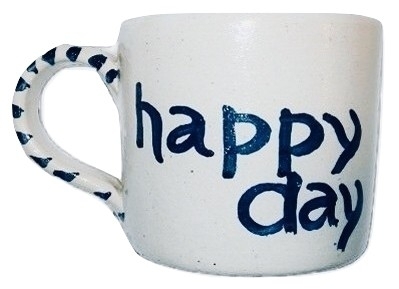 This item also has the words "happy day" on the reverse side. There is yet an additional C.A.H. signature found directly below the handle as well. Measures 2 3/4" high and 4 3/4" across from the rim to the outside of the handle. No chips, cracks or repairs. 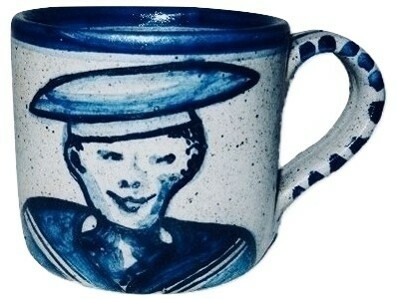 DORCHESTER POTTERY by Charles Allen Hill "SAILOR PORTRAIT" coffee mug. 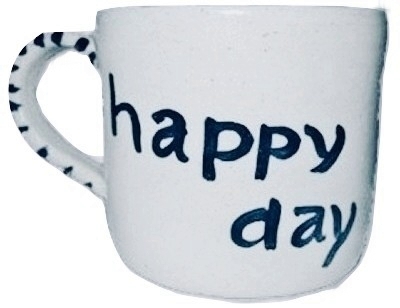 This item also has the words "happy day" on the reverse side. Measures 2 7/8" high and 4 3/4" across from the rim to the outside of the handle. No chips, cracks or repairs. 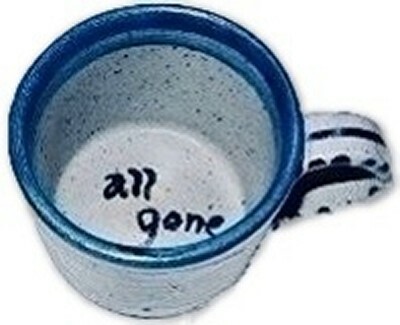 GREY MUG by CHARLES ALLEN HILL & E.H.H. DORCHESTER POTTERY by Charles Allen Hill and E.H.H. 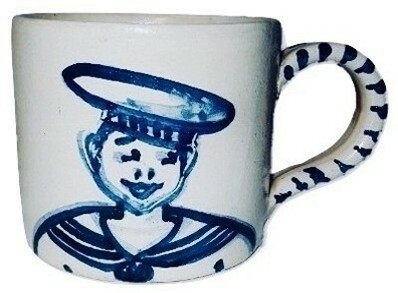 Ethel Hill Henderson "SAILOR PORTRAIT" coffee mug. Covered in a very unusual grey and blue spit glaze. 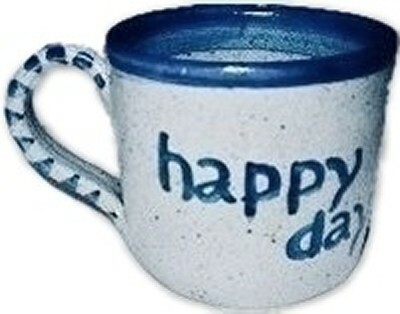 This item also has the words "happy day" on the reverse side and "all gone" inside the bottom of the mug. Measures 2 7/8" high and 4 3/4" across from the rim to the outside of the handle. No chips, cracks or repairs. 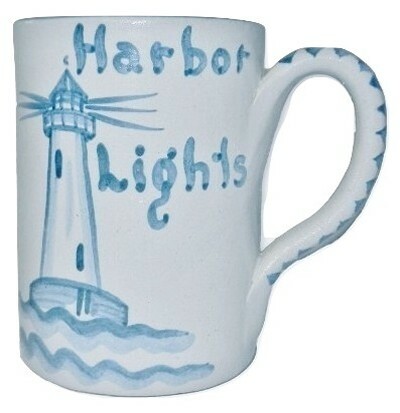 DORCHESTER POTTERY "HARBOR LIGHTS" tall coffe mug by "KNESSETH DENISONS". Measures 4 5/8" X 5" X 3 1/2". No chips, cracks or repairs. 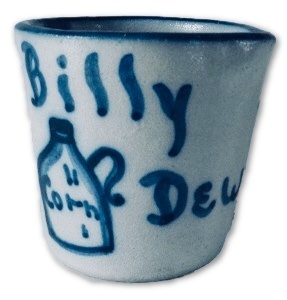 DORCHESTER POTTERY jigger titled "HILL BILLY DEW" artist signed K. DENISONS. 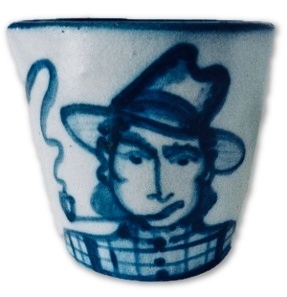 The image of a Hill Billy smoking a pipe along with a "Corn" jug. 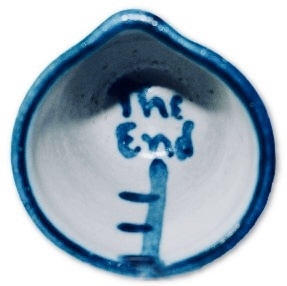 The interior is further decorated with a ruler and the words "The End". Measures 2 3/4" X 2 3/4". No chips, cracks or repairs. 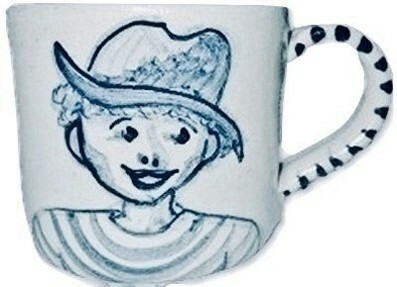 DORCHESTER POTTERY "HILL BILLY RABBIT" & "ALL GONE" cartoon character child mug, artist signed RT for Robert Trotter. 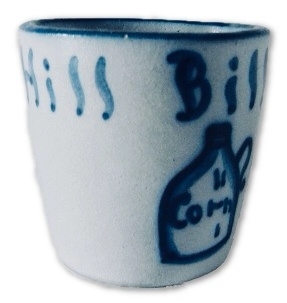 This example is the sole surviving intact piece from a child set with the 1940's - 1950's comic strip character of Hill Billy Rabbit. 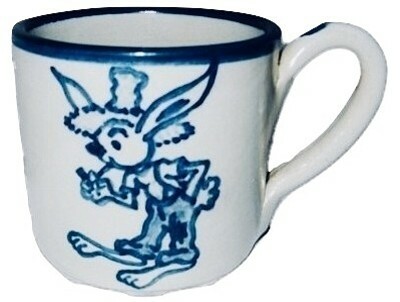 Pappy Rabbit is shown in his blue jeans, straw hat and puffing on his corn cob pipe. Measures 4 1/2" to the outside of the handle X 3" high. No chips, cracks or repairs. 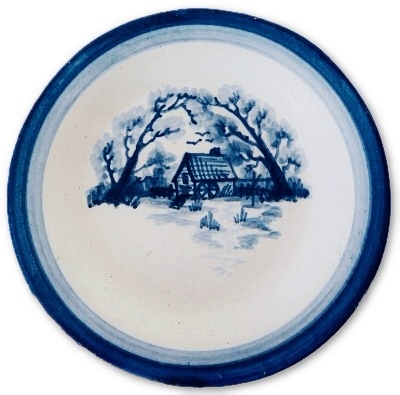 DORCHESTER POTTERY Homestead pictorial artist signed KNESSETH DENISONS plate. Measures 7 1/2" across. No chips, cracks or repairs. 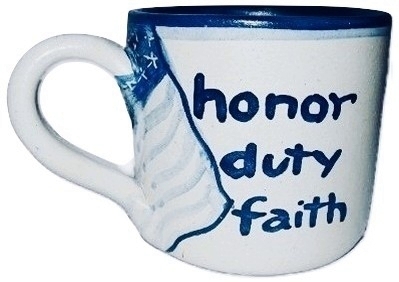 DORCHESTER POTTERY "HONOR, DUTY, FAITH" and "ALL'S WELL" mug artist decorated by C.A.H. for Charles Allen Hill. The surface is painted and incised with the American Flag, the portrait of a U.S. Soldier holding his rifle, the motto; honor duty faith and on the interior All's Well with a four leaf clover. Measures 4 1/2" to the outside of the handle, 3 1/4" across the top and standing 2 3/4" high. There is a tiny flea bite flake on the very edge of the top rim which is nearly impossible to find and may be from the manufacturing process. No other chips, cracks or repairs. 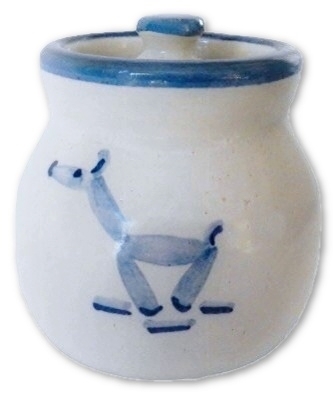 DORCHESTER POTTERY covered jar with a hand painted figure of a WHIMSICAL HORSE. Artist signed J.A.C. for Jackie Callder. This item measures 3 1/2" X 3". No chips, cracks or repairs. 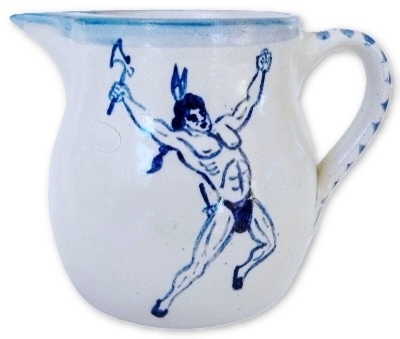 DORCHESTER POTTERY 2 FEATHERED NATIVE AMERICAN INDIAN BRAVE ARTIST SIGNED ROBERT TROTTER & CHARLES WILSON HENDERSON milk pitcher. Signed R.T. under the decorated handle and are the artist initials of Robert Trotter. The base is marked with the Dorchester Pottery C.H. early version stamp of potter Charles Wilson Henderson, son of the founder of Dorchester Pottery/Stoneware. This item has some in the making hand made pottery anomalies such as glaze skips, separations etc as are common for Dorchester Pottery. 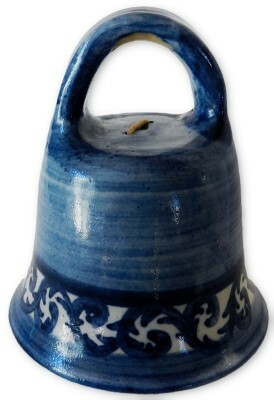 Measures 7 1/2" across from the spout to handle, stands 5 1/2" tall and 5" wide. No chips, cracks or repairs. 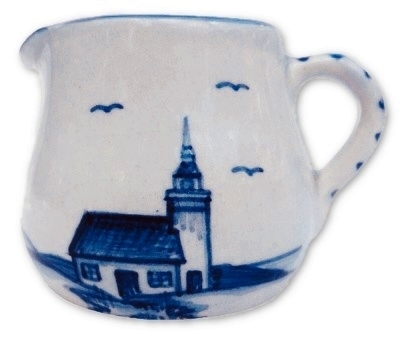 Dorchester Pottery "LIGHTHOUSE" glossy glazed creamer signed by Knesseth Denisons. Measures 3" tall. There is even light all over crazing as is common for Dorchester high glazed items. An extremely tiny flea bite spot on the edge of the spout. No other chips, cracks or repairs. 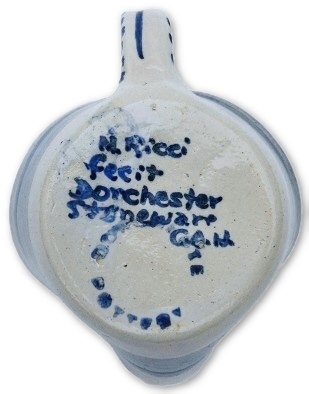 RAREST DORCHESTER POTTERY Stoneware decorated items you will ever find. 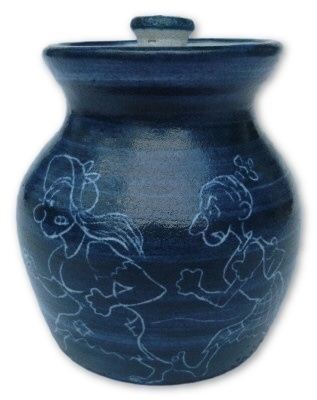 This covered pot is (incised) decorated with the comic strip action characters from Al Capp's "LI'L ABNER DOGPATCH". A staple of millions of readers from the 1930's right up till today, the social conscious of the Dogpatch characters live on in our daily vocabulary. This fantastic series of characters were often the embodiment of the social issues of the day in disguise. This example shows Mammy Yokum and Sadie Hawkins chasing Pappy Yokum and his fellow moonshiners. All the while a very young version of Li'l Abner and Daisy May tries to keep up with the moral authorities of Dogpatch. 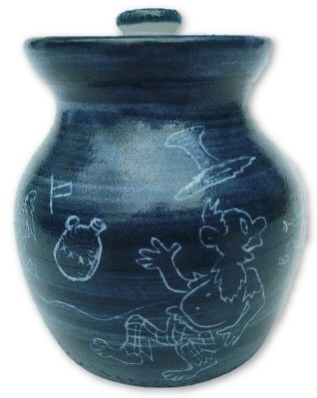 This is a complete one off, one of a kind fantasy homage to the characters of Dogpatch as interpreted by the Dorchester Pottery artist Robert Trotter. 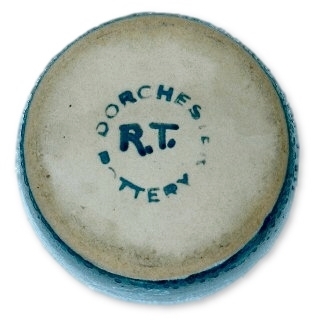 The underside of the pot exhibits the DORCHESTER POTTERY mark with R.T. the initials of the artist. Measures 3 3/4" X 3 3/4". 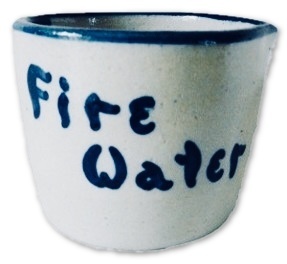 This item has the normal hand made factory anomalies associated with Dorchester Pottery's Stoneware items. No chips, cracks or repairs. 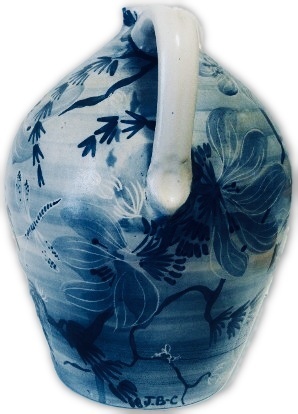 DORCHESTER POTTERY "MAPLE" artist signed KNESSETH DENISONS jug. Measures 4 1/4" X 3" across. No chips, cracks or repairs does not have cork stopper. 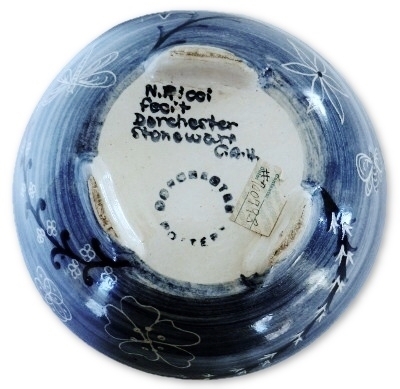 DORCHESTER POTTERY 12 1/2" charger decorated by Robert Trotter (1929-2013) and thrown by Nando Ricci in 1951. This magnificent item shows the image of Vaslav Nijinsky (1889-1950) in one of his prime roles as the "Golden Slave" in the ballet "Scheherazade." 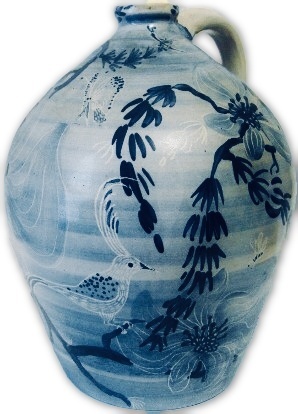 Robert Trotter was a truly talented young artist who served in the U.S. Army during the Korean War and later attended the Massachusetts School of Art for two years., When Robert Trotter returned home, he was employed by the Dorchester Pottery Company. Some of his finest works display homage to current artists, works in the film industry as well as those in the comic strip industry. 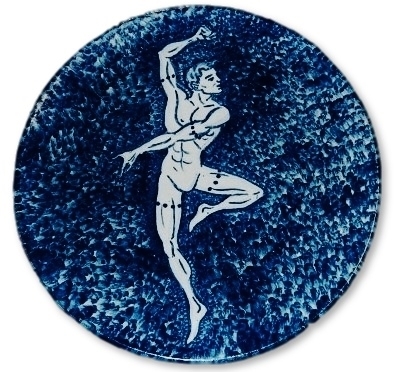 Mr. Trotter was obviously inspired by many forms of dance as is displayed in this example of his artistic interpretation of the Ballets Russes' greatest performers. The signature of N. Ricci fec. 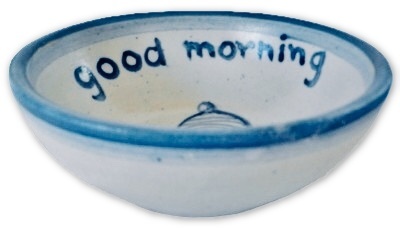 Can be found under the glaze, inscribed to the body of the stoneware. No chips, cracks or repairs. 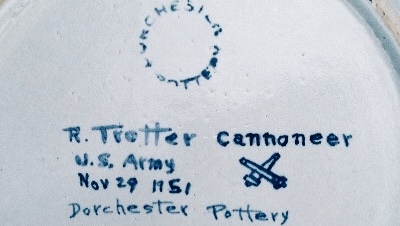 DORCHESTER POTTERY "ON THE TOWN" characters charger artist signed by Robert Trotter, Cannoneer, U.S. Army, Nov. 29, 1951. Measures 12 3/4" X 1 1/4". Robert Trotter served in the U.S. Army as a Cannoneer during the Korean War and it is possible that this massive charger is a tribute to the service period served in defense of the United States. 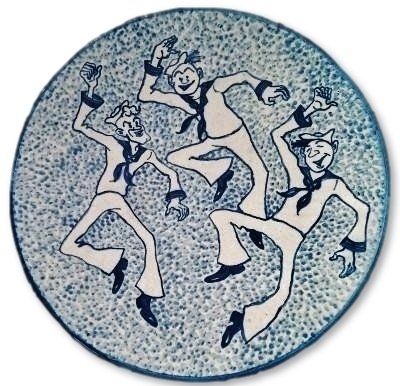 The characters are all recognizable as those stars from the 1949 film "On the Town" from left to right, Frank Sinatra as "Chip", Gene Kelly as "Gabey" and Jules Munshin as "Ozzie". The fantastic artistic work of art is one of the largest and finest we have had the honor of offering for sale. 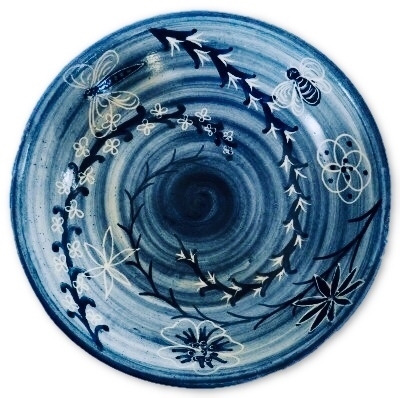 There is an in the making bottom foot ring flat flake with would have occurred when the item was removed from the kiln and is of no harm to this fantastic Dorchester Pottery charger. 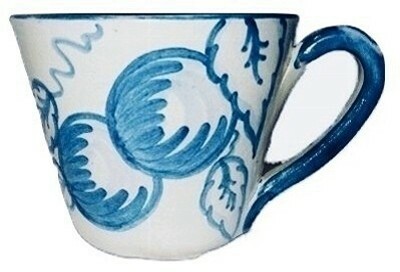 DORCHESTER POTTERY "ORANGE" pattern large coffee cup, artist signed R.B. for Ronald Brake. Measures 5 1/4" X 4 1/8" X 3 1/4". No chips, cracks or repairs. DORCHESTER POTTERY (STONEWARE) "ORIENTAL POPPY" massive bowl hand thrown and signed by master potter Nando Ricci fecit artist decorated by C.A.H. for Charles Allen Hill. This huge item measures 10 1/2" across and stands 3 3/4" high. A stunning example of artistry. 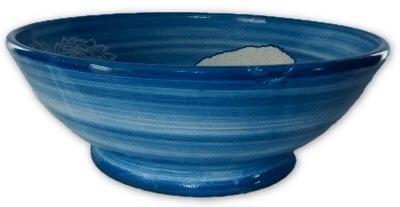 Due to the large size and weight of this item, there are two manufacturing flaws we wish to bring to your attention, they are located directly across from each other on the top rim of the bowl. 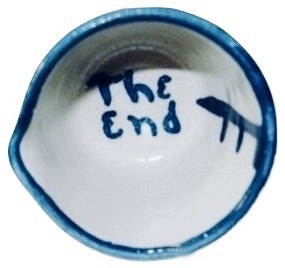 It appears that while the item was still in its soft unfired state but after the initial artist decoration had been executed, an attempt was made to move the item and you can see where a finger on each side of the rim touched. No chips, cracks or repairs. 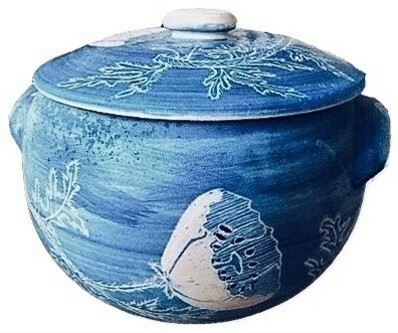 Dorchester Pottery large Covered Crock Pot by N. Ricci fecit and C.A.H. (Charles Allen Hill". 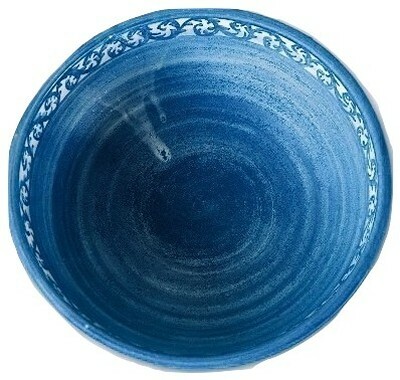 Due to the large size of this item, there is some uneven effects to the matte glaze. 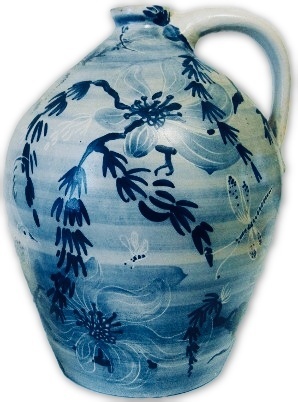 This is one of the most sought after patterns by Dorchester and will be a wonderful addition to any collection. Measures 9 1/4" X 6 1/2". No chips, cracks or repairs. 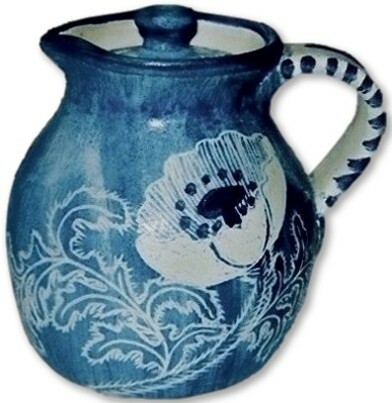 DORCHESTER POTTERY (STONEWARE) "ORIENTAL POPPY" covered pitcher signed by master potter Nando Ricci fecit artist decorated by C.A.H. for Charles Allen Hill. No chips, cracks or repairs.